One of my psychological failings is that I have a strong drive to avoid doing things that overwhelm me. I think one of the most useful things I have done this summer is my experiment in chunking to learn the Bach C MAJ 2-part Invention on the piano. This week I am reminded that it would be useful to generalize this skill beyond music. PAS doesn't always mean Practice Avoidance Syndrome. Instead of packing, what am I doing? 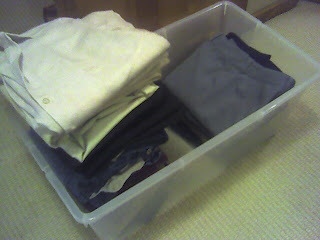 Cleaning out the closet. Yes, it did have to be done. There was no room for my new, larger-size purchases. But no, I haven't actually packed anything yet. I hope there is a market for used size 2s. them directly to my blog. I consider that a success, though the random line breaks are a bit disconcerting. Elle is helping me while I figure out how to do this on Blogger. Everything above this line was sent from my mobile phone. For anyone who's curious, I followed the directions in this FAQ to set up a mobile account and claim it to publish directly to my blog. 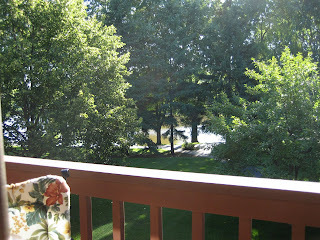 My next step is to see what happens if I attach a photo to an email for publication. Some people like to plan their trips in exquisite detail, anticipation of coming events being half the fun of the event itself. Not me. 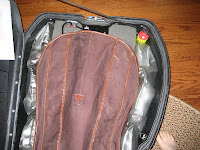 Much of my traveling is based around a conference or other organized affair, and if I'm lucky, I start looking at what I've actually got planned in just enough time to pack appropriately. The running order of The Royal Scotsman carriages is: Observation Car with verandah viewing platform; Dining Car Number One (Raven); Dining Car Number Two (Victory); State Car number one, two, three, four and five; and a Service Car. The sequence is in running order from the rear so guests can best enjoy the passing countryside. Next in the formation is Dining Car Number Two, known as Victory and so called since it was built in 1945. Victory was built as a London & North Eastern Railway Director's Saloon and acquired from Sir Bill McAlpine. The transformation was completed in a number of weeks - from its bright orange curtains and brushed aluminium fittings to wood panelling, inlaid with intricate marquetry, mahogany veneer cupboards and specially made dining chairs and tables – not to mention a state of the art modern kitchen. Eight marquetry panels with intricate designs of thistles, flowing ribbons and butterflies line the walls and an inlaid frieze of several different woods runs on into the corridors. Victory can accommodate up to sixteen guests, ensuring all guests can dine at the same sitting, across the two dining cars. The five State Sleeping Cars follow. These cars, like the Verandah car, were originally built as Pullman Cars in 1960 by the Metropolitan-Cammell Carriage and Wagon Company. The sleeping cars provide sixteen twin cabins and four single State Cabins, beautifully fitted out in rich marquetry. All cabins have fixed, lower beds, dressing table, full-length wardrobe, individually controlled heating, cooling ceiling fans, opening windows and cabin service call button. Each cabin has its own private facilities with shower, wash-basin and toilet and a constant supply of hot water. OK, then. I'm having some anticipatory enjoyment. Forgive me, it's been a week since my last post. I'm busy practicing and making cryptic practice notes in my practice blog, thus sparing you the tedium but leaving it a bit arid over here. 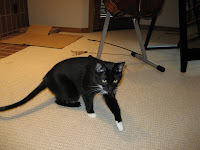 This photo demonstrates the optical illusions that happen when two cats with nearly identical markings hang out together. 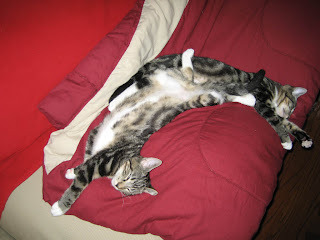 And J.J. is an especially relaxed little tom-catlet, happy to bare his belly anywhere, anytime. 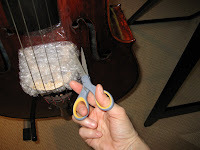 So, what about the new 'cello, you ask? Well, first it needed a few days to acclimatize and settle in. Then, I needed a few days to make some initial accommodations to the new size, feel and most of all, setup. It came with a set of Spirocore chromesteels, a much brighter string than I generally play. Oh, my. I think every one of my faults is amplified. But I love it. I really, really do. And after a few days it's training me to be more careful about my bow speed and placement. 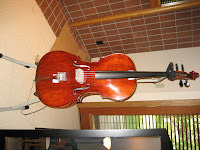 I think I'll leave these strings on for awhile, at least until I have a chance to hear them outside the practice room. Now, since I've missed a few Tummy Tuesdays and have hundreds of tummy shots of the Cousins, I've put together a slide show. 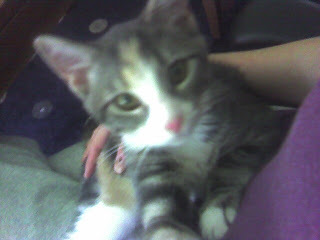 Somehow this little Popper etude just put me in the mood for looking at kitten pictures. 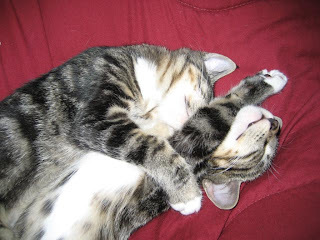 Hope you enjoy it - both the kittens, and my debut on the Patriot. I don't usually do this, but I found the coolest CD over the weekend. 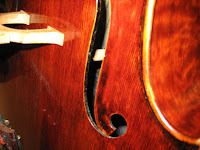 One of the things I love about studying an instrument is that my ears are becoming better and better at hearing music. 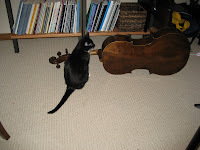 I especially like to listen to other people play the things I am studying, or have played in the past. 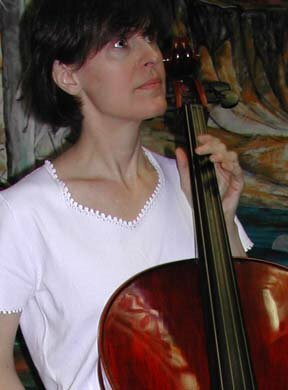 Ergo, I only began listening to cello concerti recently, in spite of my love for all things cello, as I felt them unobtainable in this lifetime. On the other hand, most of the pieces within my grasp are not recorded, so at best I have the modeling of my teacher and playing friends to shape my sound concept. I personally think there is a huge market for quality recordings of student repertoire, and have been delighted to find a few more of those recently. 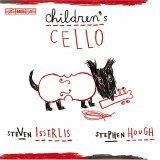 So my find - an album of "Children's" pieces recorded by Steven Isserlis (cello) and Stephen Hough (piano). 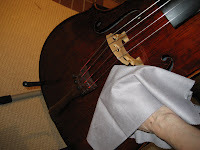 It starts with a lovely Berceuse on open strings, and goes on in a graded fashion, including many Suzuki favorites as well as delightful pieces I had never heard before. I am totally pumped - I could play these! Well! Nothing like a beautiful and attainable goal to get the practice juices flowing. 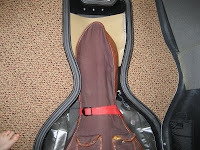 That monstrous, cool-looking case with the cat ears is a David Gage cello case. It's not mine; it's Anne's, and this is not its first trip. 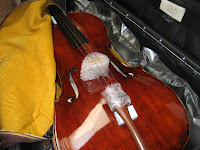 It's traveled the globe, carrying cellos to prospective and new owners, returning to Anne, sometimes empty and sometimes not. This return flight will be empty. The case is built like a fortress, but fortunately I've received advance instructions to look for the hex wrench under the duct tape. 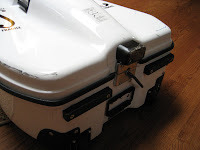 There it is, snuggled around the lock on top of the case. It fits that way, but somehow doesn't seem right. ...and one more on the bottom. 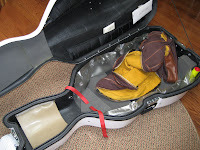 Inside, the cello is packed in a vintage canvas case, covered with a fine substance that looks suspiciously like cat hair. 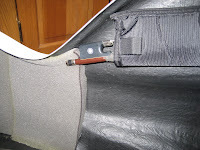 ...and a system of airbags inflated around the sides. 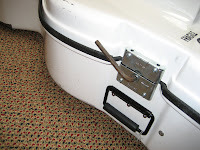 There are four bow cases, two in the Gage case and two in the canvas case, one of which contains a bow. It's a well-used Glasser, so I am assuming it is a permanent occupant of the case, and not meant for me. 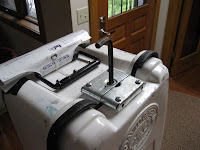 ...ensuring the integrity of the cord that attaches the two sides of the case. Note how she carefully avoids stepping in the bridge. Obviously well-trained in these exacting procedures. 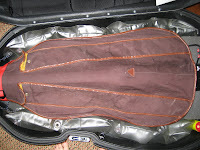 Phewwwww - the sound of exhaling as the case is unzipped to reveal an absolutely gorgeous and apparently intact 'cello. 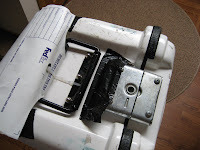 More styrofoam blocks under the tailpiece and fingerboard, and bubblewrap around the tailpiece and bridge. 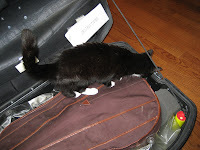 The 'cello is removed from the travel case, and after careful consideration, Inspector #1 sniffs her approval. 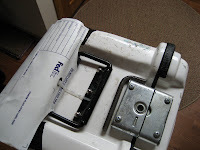 The canvas case lies crumpled in the Gage, rather like a discarded snake skin. 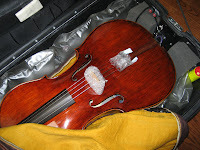 New 'cello is carried to the practice room, heart in throat (mine), and placed on the cello stand. Inspector #1, still on the job. Is she getting overtime? ...and immediately walks over to check out Emma, recently displaced from the stand and now homeless. 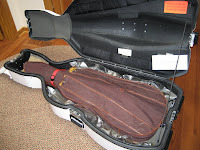 I really need to get another cello case. Or two. 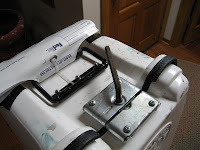 The styrofoam blocks are removed, and the bubblewrap is carefully clipped away. A brand new microfiber cloth to gently wipe away the packing dust, and careful visual inspection. No cracks seen. Another big whew. ...the bridge is straight, and the feet haven't moved. 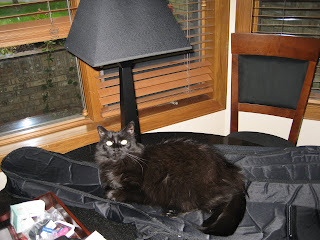 There's Madeleine, observing from her spot on the table. 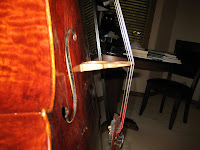 The strings were under very light tension, so I've tightened them slightly and will slowly bring them up. 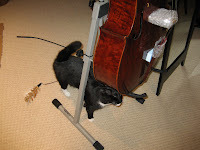 No reports on sound until sometime tomorrow, but if you want to learn a little more about my new 'cello, you can see it here. Yup, that's it on the front page, a very special instrument. There's more later... it's called the Patriot. Now I really need to go finish my piano practice. I think I'll take a quick shower while I'm waiting for the "all clear"... then it's time to unpack! Black has always been my favorite "color." I discovered this in elementary school, when we made "art" that was created by coloring a picture hard in crayon, then washing the paper with black water color paint. Funny, I never wore black clothes until college, and I guess it's just as well I grew up in the pre-goth era. 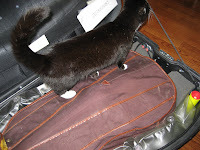 Recently I threw my black soft-cover cello case on top of the table, just to get it off the floor, and as usual it's remained there a lot longer than it should. 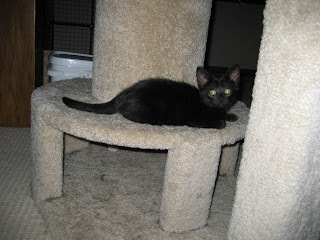 And yesterday I discovered that this forms one of Madeleine's current favorite chillin' spots. 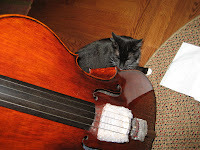 She seems to enjoy listening to me practicing Bach on the piano. Tough to spot her at first, though, all that black on black on black. I got a new toy just before my big computer crash, when life as I know it got much more difficult. Yes, it's an abacus. Did you know that there are two kinds of abacuses (abaci?)? This is referred to as a Chinese abacus, which has rows of 10 beads. The Japanese abacus has a divider, with 5 beads on one side ("earth") and 2 beads on the other ("heaven"). I know this now because I borrowed a book from the library to learn how to use the Japanese model, having never seen one before I went shopping. I am not using my abacus for calculating, but for counting. Repetitions. While practicing. Before I got it I was using a handful of jelly beans, which I moved one at a time from one side of the stand to the other. I found I also needed a little flag, so I knew which side I was moving toward. I suppose I could have picked up the whole pile and moved it to the "starting side" before I began each set of repetitions. But the most complicating aspect of counting with jelly beans was my strong desire to eat them. Which meant I had a steadily decreasing number of repetitions available. One could argue that there is no need to count if you are simply repeating a section until you have played it correctly x number of times. While that is fairly simple to keep track of in my head, a book I read recently (it's in my stack of new piano music) recommended physically moving something to count, not purely for the keeping-track-of benefit, but also because the act of moving it requires you to reset your hands, and by extension your mind, before you start again. I think the author was on to something. Today I learned segment C2 in my Bach invention at one session, then put it together with segment C1 in a second session. I have been using the metronome specifically to fight my tendency to vary the tempo wildly depending on how hard the lick is, and Joshua was right on when he called me out for not sticking with it. SOoo I slowed way down to 8th=56 and practiced in rhythms, using only the long-short and short-long variation. Wow, you really have to know the next note coming when you are in the long wait period at that tempo. Can't rely on muscle memory. Then I played it 10 times at 72, concentrating on improving the legato-ness in the phrases. Here's today's work. I'm really quite pleased with the result. And somehow counting with the colored beads on the abacus increases the fun-ness of practicing. C2 at 8th=80. Still not quite on the beat. C12, 10th rep at 8th=72. I think I'm staying with the metronome better, but did you hear any improvement in legato?